Scatter almonds on a small baking sheet and toast them in the oven for 5 minutes or until they start to lightly brown. Quickly remove from the oven to avoid scorching them. Set aside on a paper towel to cool. In the bowl of a stand up mixer fitted with the paddle attachment, combine yeast, sugar, and water. Set aside for 5 minutes or until mixture is frothy (this means yeast is viable). In a medium bowl, whisk together coconut milk, agave or maple syrup, and salt. In a large bowl, whisk flour and 1/2 teaspoon cinnamon together. Add coconut mixture and 1-1/2 cups of flour mixture to mixer bowl and blend on low speed until combined. Switch to dough hook and add remaining flour, mixing on medium-low speed until dough comes together. Knead with dough hook for 5 to 6 minutes or until dough is smooth. Dump onto a lightly floured surface and form into a ball. Place dough in a greased bowl, cover with a damp towel, and set aside in a warm draft-free place. Let rise for 45 minutes or until doubled in size. Punch dough down and transfer to a lightly floured surface. Roll dough into a rectangle about 1/4-inch thick. In a small bowl, mix together almonds, 1/4 cup brown sugar, and remaining cinnamon. Brush dough with about 2/3 of the margarine and sprinkle with almond mixture. Use a sharp knife to cut dough lengthwise into 12 strips. Roll each strip to form a roll. Spray a 10-inch round baking pan with cooking spray. Place cinnamon rolls in pan (cut side down) and cover with a damp towel. 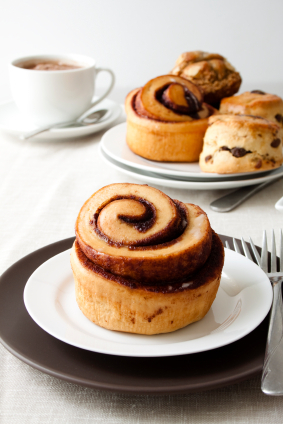 Let cinnamon rolls rise for 20 minutes. Brush with remaining butter and sprinkle with remaining brown sugar. Bake for 20 to 25 minutes or until golden brown. Serve warm.